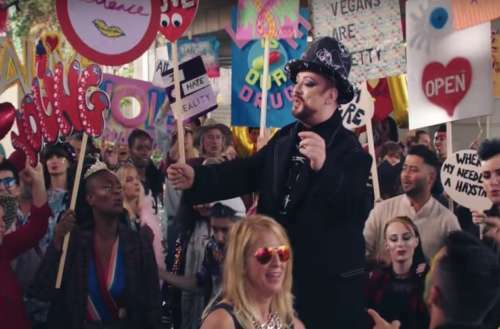 In the new Culture Club video, Boy George visits a highway underpass to find many people divided into different groups, listening to speakers of different races, genders and beliefs. As he sings, he unites the people. Then, midway through the song, the folks all bust out with colorful protest signs, though it’s a lighthearted protest, with most of its signs promoting love and individuality. Eventually, everyone joins Michael as he leads them in a simple line dance. Though there were plenty of preening androgynes with flamboyant plumage back in the ’80s, Boy George was truly the peacock’s tiara. His genderqueer style and smooth radio hits like “Do You Really Want to Hurt Me?” and “Karma Chameleon” helped keep him and Culture Club as part of the cultural conversation throughout the decade. The new Culture Club video also reflects George’s changing life experiences.In 2009, Boy George served four month in jail for the assault and false imprisonment of Audun Carlsen, a Norwegian man who he handcuffed in his basement. Boy George blamed drugs for his actions. Since 2012, Boy George has practiced Buddhism, a spiritual system that stresses loving-kindness, as a way to stay sober. Culture Club broke up in 1986, after Boy George finally admitted his ongoing drug addiction. Though the band reunited briefly in 1998 and toured in 2002, it didn’t properly reunite until 2014 when it started recording new material. “Let Somebody Love You” will appear on Culture Club’s new album, Life, when it debuts on Oct. 26, 2018. 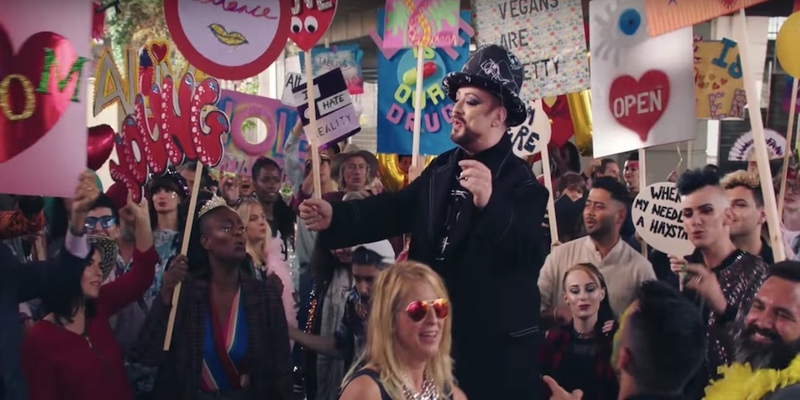 What do you think about the new Culture Club video for the new Boy George song?